Buick over the years has not gotten the credit it deserves. Though most of its reputation was built on offering quality luxury for a reasonable price, it has had its share of performance and fuel efficient offerings. When it comes to fuel efficient cars in some respects Buick has at times been way ahead of the curve. 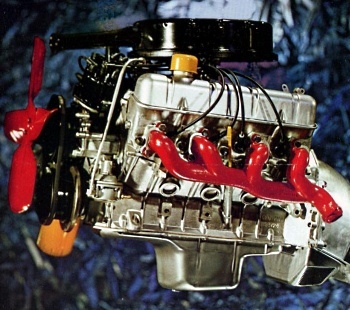 For instance back in the mid-1970s when most automakers began the conversion from large and medium displacement V8s to low displacement V8s to increase fuel efficiency, Buick decided to forgo developing its own low displacement V8 and instead put all its eggs in its very fuel efficient 3.8 liter V6 (and 4.3 liter V6 to a lesser degree). This was a bold move since American buyers loved V8s, but Buick was smart enough to see the writing on the wall. Even with its late-1970s Buick performance offerings, it put a turbo unit on its 3.8 liter V6, rather than use another GM division’s V8. Most at the time were wondering what Buick was thinking, by 1986-1987 when the SFI turbo 3.8 liter V6 powered Buick Grand National was the fastest American production car (faster than even the 1986-1987 Corvette) from 0-60 mph and in the 1/4 mile – everybody understood. And Buick’s efficient 3.8 liter V6 soon became the engine of choice in many of GM’s new front-wheel drive cars by the mid-1980s and continued to be produced until 2008. What’s even more amazing is that the Buick V6 was in production for almost 50 years. Over 25 million Buick V6s have been produced over this time span. What’s interesting about this story is that Buick only a few years after introducing the V6 for the 1962 model year, (in 1967) sold the engine design to Kaiser Jeep which produced the engine for a few years until Buick bought back the engine tooling in 1974 from AMC (which was Jeep’s new owner since 1970). This was not the only engine Buick sold to another company; the other was the OHV 215 CID V8 which was Buick’s small-block V8. The 215 V8 was released in 1961; it was one of the most advanced production V8s in the world at that time. It was lightweight and powerful. The block and heads were both aluminum which allowed the engine to weigh in at a very light 318 pounds. 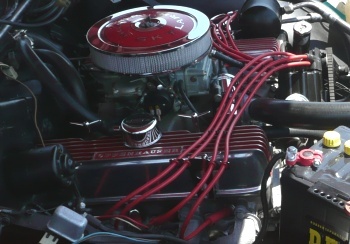 Horsepower for the 1963 Buick (4-bbl) 215 V8 was a very impressive 200 (gross) horsepower (185 and 190 horsepower for 1961 and 1962 respectively). Now that may not seem like a lot compared to most muscle cars of the 1960s. However let’s examine this a little more closely. During the muscle car era the ultimate goal a production performance car engine could reach was the 1 horsepower per cubic inch of engine displacement mark. The 1963 Buick 215 V8 made .93 horsepower per cubic inch. Let’s compare that to Buick’s ultimate high performance V8 engine – the 1970 Stage 1 445 CID V8 which Buick rated at 360 horsepower, comes out to .79 horsepower per cubic inch of displacement. Of course Buick underrated the Stage 1 455, some experts believe the real horsepower rating of the 1970 Stage 1 455 was 415 (gross) horsepower. Even if that is the case at 415 horsepower the Stage 1 would have had an output of .91 horsepower per cubic inch which is still lower than the 1963 Buick 215. Most muscle car era high-performance V8s could not beat the horsepower per cubic inch ratio of the 1963 Buick 215. Oldsmobile however had it beat. For 1962-1963 Oldsmobile offered a turbo version of the Buick 215 which had oddly enough a 1-bbl carburetor, total output was an impressive 215 horsepower – exactly 1 horsepower per cubic inch. There was also a low-compression 1961-1963 2-bbl Buick 215 which produced 155 horsepower. The 215 V8 engine was a big success for Buick, it was produced in large quantities and it provided good reliable service. Only downside was the aluminum 215 V8 was more expensive to make than a conventional iron block V8. The Buick V6 was based on the 215 V8’s architecture – however Buick went with a cast iron block with the V6. Rover which purchased the rights and tooling for the aluminum Buick 215 V8 in 1965, successfully used this motor (in different displacement sizes) in its cars and SUVs for about forty years. This small-block Buick V8 also saw service in other cars including performance oriented sports cars like the Morgan Plus 8, Triumph TR8, TVR Griffith, and TVR Chimaera. Even the late-model Westfield SEight uses a variant of the old Buick 215. However the Buick 215 V8 is most famous for it being the primary V8 (in different displacement offerings over the years) for many different Land Rover models including the upscale Range Rover. So what went wrong? Why did Buick make such a big colossal mistake by selling the 215 V8? It was simply a case of Buick being too far ahead of the times. Back in 1963 when gasoline was 29 cents a gallon there was no demand for engine efficiency. If Buick had released the efficient aluminum V8 in 1971 instead of 1961 it would have been a different story, by 1973 when the first oil crises hit. The Buick 215 would have been GM’s hottest ticket in the 1970s and 1980s when a powerful and very efficient low displacement V8 was really needed. The mega success of the 215’s V6 brother proved that 215 would have probably been a mega hit. In fact history may have been altered; we may be now talking about high-performance aluminum 215 V8 powered 1984-87 Buick Grand Nationals (instead of turbo V6 Grand Nationals). There may have even been a SFI (Sequential Fuel-Injected) turbo Buick 215 V8 variant. Of course now we’ll never know. GM’s A-body compacts made their debut in 1961, Pontiac and Oldsmobile had their versions which also made use of the new Buick 215 V8. Buick’s A-body offerings were the “Special”, “Special Deluxe”, and “Special Skylark”. The Special was the base model, the Special Deluxe was a step up, and the Skylark was the upscale offering. The Buick 198 CID V6 (the same engine block as the later Buick 3.8 liter V6) made its debut on the 1962 Buick Special. All the 1961-1963 GM A-bodies had (what was then a state-of-the-art) a unibody structure. These were light cars and very quick. The 1963 Special Skylark weighed in at 2757 pounds for the 2-door hardtop coupe and 2,810 pounds for the convertible model. When equipped with the 4-bbl 215 V8 – those 200 horses and 240-lb ft of torque (at 3200 rpm) gave the Skylark a lot of power. With the Skylark’s light weight and more than adequate torque gave the Skylark plenty of pulling power from a dead stop to normal operating speeds. You don’t have to tell any of this to Randal Avallone who happens to be one of the lucky people to own a 1963 Buick Special Skylark equipped with the 4-bbl 215 V8. He has conversed with old timers who mention how fast these 215 V8 powered compact Buicks were – with some former owners telling stories of beating many other cars in races back in the day. One such story was of a 4-speed Skylark beating in a street race a 1957 T-bird on Highway 17 in Myrtle Beach, South Carolina. Understanding the lay of the land back in 1963 – this was before the GTO and other similarly lightweight large displacement muscle cars it was even a year before the release of the 1964 1/2 Ford Mustang. A buyer who wanted a hot performance motor back in 1963 in a light car did not have to look any further than the performance oriented Buick Special Skylark. At a base price of just $2,300, it was one of the hottest performance cars for the money in 1963. Randal is part of a growing number of classic car owners who have recently flocked to the forgotten 1961-1963 GM A-bodies. 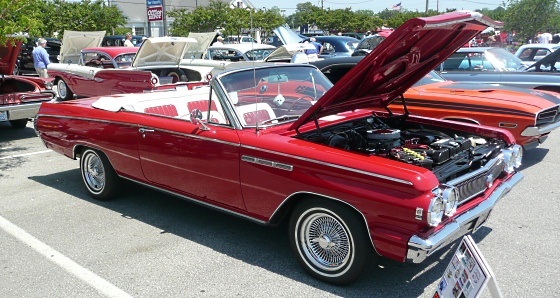 These cars especially the Buick Skylark and Oldsmobile F85 Cutlass are now becoming more common at classic car shows. For Buick fans like Randal the 1963 Skylark is a very smart choice, for its styling subjectively was the best of the A-bodies for 1963. And you can bet for Buick muscle car fans who are seeing the supplies of Buick GSs/Gran Sports dwindling while their prices continue to skyrocket will be gravitating to the still reasonably priced 215 V8 powered 1963 Buick Skylark. Randal’s convertible Skylark has some convenience options like air-conditioning which was rare for most convertibles during this era. Even after almost fifty years Randal’s air-conditioning system works well blowing ice cold air. His car is equipped with the two-speed automatic transmission. This transmission utilized clutch plates rather than a torque converter. When the clutch plates activate (just in the same way a modern torque converter would) Randal mentions the transmission feels more like a 3-speed automatic. The weak links on the 2-speed auto are the poor oiling system and being an air cooled transmission which like all other air-cooled transmissions could have some overheating issues under heavy duty usage like towing or in bad traffic jams. However even with these shortfalls, functionally the transmission does what it is supposed to; Randal comments how smooth the transmission shifts. Also available on the Skylark was a floor mounted 3-speed manual or 4-speed manual transmission. Randal’s car originally came from the factory painted in white, however when he purchased his car a few years back it had been changed to red. By this time the car needed a new paint job. As when this is always the case, it presents the owner with a big dilemma. Randal had at first thought of converting it back to its original color however he had an epiphany and figured why not repaint the car in red and add a big white hood and trunk stripe to mimic the exterior scheme of one of Buick’s best show cars. The car was a very sporty and popular show car back in the day – the 1963 SR 200 Skylark (convertible). 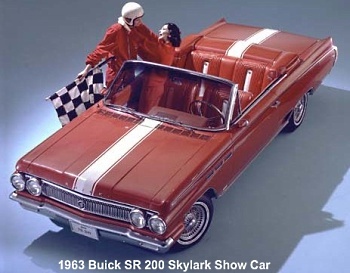 The SR 200 Skylark show car was Buick’s way of showcasing the performance nature of the 1963 Buick Skylark. The SR 200 with its wire wheels along with its white exterior and interior stripes really turned the Skylark into a real looker. In fact the 1964 GTO did not look as sporty as the SR 200. Had Buick decided to offer this paint scheme along with dropping a Buick 401 (CID) Nailhead into a 1963 Skylark, we would have never heard the end of the accolades from muscle car fans concerning the 1963 Skylark. Buick mistakenly decided not to offer the paint scheme as an option on any of its A-bodies. Buick would eventually get the courage to release an exterior scheme as bold as the SR 200’s with the release of the 1970 Buick GSX however it was a little late. 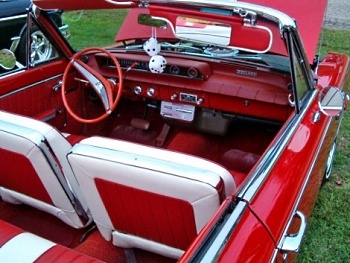 The interior of the 1963 was modern and extremely attractive. Buick after WWII was well known for offering better than average interiors that bordered in some cases of being very posh. One look at the Skylark’s bucket seats and sporty dash layout will easily make you a believer. Makes you wonder what all the fuss over the 1964 1/2 Mustang interior was about. Randal remarks that his Skylark is very roomy for such a light car. Five adults can fit very comfortably in the 1963 Skylark. The Skylark was a good handling car back in the day. Just imagine a light car with only a 318 pound V8 over the front wheels. Now visualize a 1964 GTO which had a 389 CID V8 which weighed twice as much (650 pounds to be exact) as the Buick 215 V8 sitting over the front wheels. You can see where Buick’s Skylark was more in line with the European touring car tradition which had a perfect balance of handling, acceleration, and braking – these European cars had much smaller displacement engines on the average than American cars. Ironically the Pontiac GTO took its name from the 1962-1964 Ferrari 250 GTO which was the best example at the time of this perfect balance. In essence the Buick Skylark would have been better suited with the “GTO” label. Buick interestingly enough promoted the ability the Skylark and its Special brothers to turn into even the tightest of parking spots. Braking was also better than most 1963 cars; helping of course was the Skylark’s very light curb weight, but the new for 1963 finned drum brakes also played a part. The finned design allowed better cooling than previous drum brakes especially during driving conditions where heavy use of the brakes was required. For 1963 the brakes were also self-adjusting. With the release of the GTO for 1964, the displacement wars forced Buick to eventually release its own large displacement muscle car – the 401 Nailhead V8 powered 1965 Buick Gran Sport. The Gran Sport name would soon thereafter be shortened to “GS” for some years only to change back to “Gran Sport” in 1973 on the A-body. The 1965 Buick Gran Sport was based on the Skylark (A-body) platform. The GM A-bodies grew bigger (essentially moving up to intermediate sized cars) in 1964 and in the process went to the more traditional body-on-frame design. The Buick A-body would grow bigger and heavier throughout the 1960s into the 1970s and would eventually be downsized in 1978. 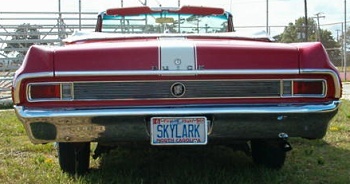 The Skylark name would jump from the A-body to the Nova based Buick X-body in 1975 and then in 1986 to the Buick’s compact N-body where 1998 would be its last year in production. The 1963 Buick was the end of a short era for Buick. However it was also a beginning – the 1963 Special Skylark was a very attractive car; it had grown in length by 5 inches to 191 inches for 1963 however the wheelbase remained the same as the previous two years at 112 inches. The 5 extra inches really made a big difference – it gave the car the same nice flowing lines of the full-size 1963 Buicks. Very understated fins were there, providing a little nostalgia from the 1950s just like the traditional front quarter panel Buick portals. The lines from the side doors to the rear of the 1963 Skylark would be copied by upcoming A-bodies including the 1964-1965 GTO. Randall commented that the headlight design on his 1963 Skylark with the four protruding headlights has a retro 1950s look – the look was also borrowed from the 1962 full-size Buick line. One thing muscle car owners can attest to is that in recent years it has become very pricy filling up the gas tank. Randal is one of the smart ones who has found a happy medium – his car provides plenty of punch yet sips on the gas with gas mileage as good as just over 20 mpg. Now imagine how good the gas mileage would be with a modern transmission with overdrive and computer controlled fuel injection? Buick certainly was way of ahead of its time with the 1963 Skylark. Nobody needs to tell Randal this – Buick’s innovation and forward thinking are enjoyed and put to good use by 1961-1963 Skylark owners like Randal. The smart money is on the 1963 Skylark, it most certainly will see a nice uptick in value on the collector market in the coming years. Anyone wanting a very efficient but powerful classic muscle car – the Skylark is just the ticket. They can still be purchased for a reasonable price. Seeing the 1961-1963 215 V8 powered Skylarks at car shows provides a nice change of pace from all the typical muscle cars seen at most modern car show venues. It’s only a matter of time before the collectors come swooping in and 1963 Skylark prices begin to skyrocket. The next time you hear from muscle car fans the same old tune that it all started with the 1964 Pontiac GTO; you can chime in and mention how the 1963 4-bbl 215 V8 powered Skylark made more horsepower per cubic than every production GTO from 1964-1974. My guess is you will have a lot of surprised people. Special thanks to Randal Avallone who provided the pictures and information used in this article of his beautiful 1963 Buick Special Skylark (SR 200 tribute car).